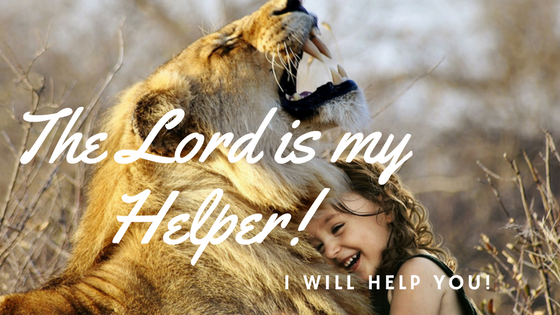 One of the first bible passages I learned was “The Lord is my Helper!” These words continue to hold promise with ever deepening meaning. In some aspects, I can have an over confidence in my own strength, knowledge or ability. However, when I ask God for His help, the difference He makes is remarkable. Every year possesses milestones of accomplishment that are tangible evidence of God’s every present help in my life. Sometimes He uses those closest to me; often He comes beside me in a way only He is capable of. As a grandmother, I never grow weary of hearing our grandchildren or even grown children ask for help, especially in the area of prayer. Such requests affirm worth and significance. They unite us in a stronger family community. Both natural and spiritual families help each other! When I was young, my older brother and I enjoyed climbing trees. On one such occasion, I was dressed in my Sunday best complete with black patent shoes. Of course my footing slipped on the rough branch and down I fell. The silver buckle of one shoe caught a twig and held me suspended midair, upside down. By brother, anxious to help, undid the buckle. Head first I plunged to the ground below. With one broken arm and a few minor scrapes, I proceeded to the house to confess my errors and accept the consequences. Some kinds of help are a little more valuable than others! Although my brother had good intentions, he wasn’t the wisest helper. He did manage to get me out of the tree, but not safely to the ground. The doctor who reset the break and provided a cast was more beneficial! One of the greatest hindrance to asking for and receiving help is our independence. Sure! I can do this on my own! Here, let me do it for you! Parenting includes training and developing our children to be able to function independently from us, leading productive and purposeful lives. Of course, this is necessary. Yet independence can seriously hinder our relationship with the Heavenly Father. One of the keys to living spiritually productive and purposeful lives is leaning into God and laying aside our independent ways. Beyond a doubt, relying on His strength, wisdom and power gives us the confidence to walk boldly. I never allowed my brother to “help” me out of another tree; I learned I could not completely trust his judgment! God, however, can be trusted completely as our Helper. Jacob’s name means “one who trips up or overthrows another”. It was a fitting name since he robbed his brother Esau of his birthright twice. Jacob’s life was a journey of trusting and allowing God to change his heart and motivation before he could rightly receive the name change to Israel, one who wrestles with God. God never abandoned him in his process. He won’t forsake us either! He is committed to help see us through our personal journey! We are not yet what we are going to be. As we continue to rely on Him, He will bring us through to maturity. “I am with you; do not be dismayed, for I am your God. I will uphold you with my righteous right hand … I will help you. I recognize daily my continuing need the Lord’s help. Sometimes, I need far more help than I even realize! “Here I am! I can help you with that! Looks like you could use a little help! I could be so much help to you right now! MaryAnn, I am your Helper! If I help you, you will be so helped you will be able to help those around you. Really? Nothing is too small or big for Me to help you with! Let me help! I, Myself, will help you! Sounds so ridiculously easy, but it is true! I aim to capture the childlike quality of willingly asking and accepting my Heavenly Father’s help. Only when I draw close and lean into His powerful and sufficient strength will I fully realize what we can accomplish together. If the past is any indication, His help will be unbelievably amazing in the future! Join the tribe of followers here! ← Beauty Instead of Ashes! Out with the Old! In with the New!